How do you escape a hostile alien world where your only possible friend is…your sworn enemy? Andy and her squad have crashed landed on an un-named alien world. When faced with hostile aliens, their only option is to turn to their sworn enemy for help. Can Andy and her Marines escape bloodthirsty aliens and the Arkana or are they doomed to end their days alone on an unknown alien world? 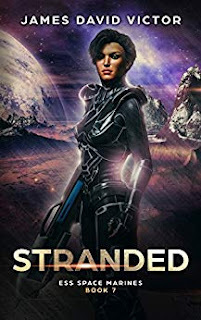 Stranded is the seventh book in the ESS Space Marines series. If you like fast paced space adventures with engaging, and quirky, characters, you will love Andy and the ESS Space Marines.